Japanese Episode AG 098: "Guraadon VS Kaiooga! (Kouhen)"
American Episode 370: "The Scuffle of Legends"
Now that Aogiri has gained control over Kyogre, he orders the pokemon to attack! As the beast causes destruction all around it, the members of the Aqua-Dan and the Magma-Dan can only look on in horror. Elsewhere on the island, Musashi-tachi attempt to free Groudon so that they can give it to the Boss. As they struggle with the prison's control panel, Pikachu, who had managed to escape from its cell, appears and sends the Rocket-Dan blasting off. After Satoshi is freed by Wataru's Kairyuu, he proceeds to follow Pikachu, who is in the process of freeing Groudon. After the ground-type pokemon is liberated, it immediately sets its sights on Kyogre. The two legendary pokemon begin an epic battle, with Pikachu getting caught up in the middle. Satoshi resolves to rescue his pokemon, so a plan is concocted to distract Aogiri enough to upset his control over Kyogre. Takeshi and Haruka release their pokemon and have them attack Aogiri, and before long the Red Orb falls out of his body. The Blue Orb falls out of Pikachu soon after, freeing both the legendary pokemon from the control of their masters. The mythical pokemon return to their homes as Satoshi and his friends watch with a newfound appreciation for the majestic power of pokemon. I'll admit it now; I'm pretty hard to please. There are a lot of flaws that I see with the Pocket Monsters TV series, but the biggest, most damaging flaw, in my opinion, is that the show has tons of potential that it doesn't live up to. This episode here is a perfect example of this wasted potential. First of all, the animation in this episode is just terrible. You'd think that with a little more thought into the planning of these episodes, the show's producers could have arranged it so that one of the good animation teams could work on this important episode. But they didn't. Every character is off-model in this episode (particularly Groudon), and the animation ranges from limited to non-existant. 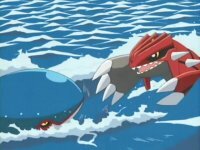 Really guys, the epic battle between Groudon and Kyogre should not be reduced to a series of still images, but that's pretty much what we got here. If I wanted to watch a slide show, I'd watch the last few episodes of Neon Genesis Evangelion. In addition, the conclusion is so rushed that it isn't funny. So the orbs just inexplicably fall out of the bodies of Aogiri and Pikachu, and it's all over just like that? Kyogre and Groudon just go home, acting as if nothing happened, and we don't see the Magma-Dan and the Aqua-Dan leave or show any indication that they'll disband. And Wataru? He gives his speech at the end of the episode and then stays there. We never see how the gang gets off the island, or their departure from Wataru, or anything important like that. This storyline was just begging to be a three-parter. Later, two seconds are cut from the episode's title screen. James: "Because it just didn't seem right to take it from behind." Y'know, it was kinda funny when 4Kids used to throw innuendo like this into an episode every now and then. But now they're doing it in like every single episode, and it's just getting old. The shot of Groudon after it's revived and Archie's "Groudon's here!" was originally played two times in the Japanese version - once before the commercial break, and again after the commercial break. 4Kids cut the repeated occurrence of this footage since the commercial break in the dub occurred earlier in the episode.